For those of you who don’t know me, it is pretty obvious that I love everything to do with design. The most exciting parts of my job is keeping up with the latest trends and styles in design. One of my favourite things is to see old trends coming back to life with an innovative twist. Right now, we are seeing a huge revival of terrazzo, muted pastels and brass in all areas of design – and I must say I am going crazy for it! Terrazzo – it has been around since almost the beginning of time and has been referred to as the “original sustainable flooring” as it originally took the scraps from opulent jobs and incorporated them into a cost-effective flooring for patios. Today, Terrazzo continues to re-constitute left over materials like marble, quartz or recycled glass to create a now “high end” sought after sustainable floor. So how has this age-old material been revived you ask? Currently we are seeing multiple shades of terrazzo being paired with brass in-lay to create beautiful texture and interest that can be applied almost anywhere in your home! 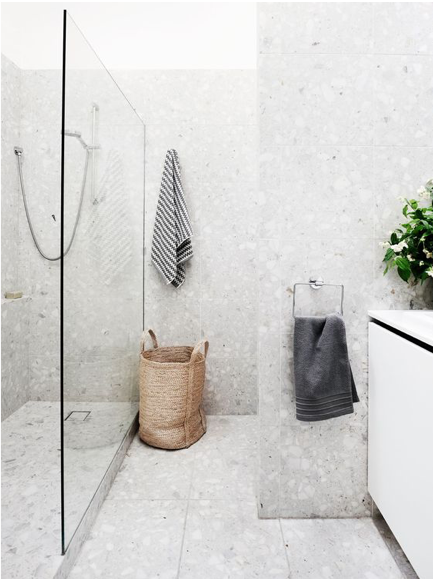 One of our favourite applications right now is using terrazzo on all surfaces in bathrooms as seen above and below. I just can’t get enough of this updated revival right now! Another design revival that has been trending in all areas of design is muted pastels. No, don’t panic! This is not your mother-in-law’s 80’s pink toilet you just ripped out, these pastels such as Benjamin Moore’s Bronzed Beige or Muddy York have been muted with muddy neutrals to bring them on trend. My favourite places we are seeing this trend right now are in furniture pieces like the Beetle Chair by Gubi or the Stay Chair by Sè. These furniture pieces feature an array of muted pastels paired with brass accents. Another obsession of mine, which combines the two trends of terrazzo and pastels, is the new 2018 Metropolitan collection from Caesarstone. We are currently loving the newly released Frozen Terra and are using it an upcoming residential renovation project – can’t wait to show you when its complete! If this trend scares you, try something a little less permanent to get your toes wet like an accent wall. Brass has been around for a long time and generally has not gone away. What we are seeing right now as an updated trend for brass is its finish and application. Generally, brass has been used in a high sheen finish and very sparingly in the interior. Now we are seeing brass being used in a matte finish all over the home. This can be seen in plumbing fixtures & accessories, cabinet hardware, lighting, furniture, cabinet doors and the list goes on. Check out our featured THE BANFIELD kitchen in the Kohler Signature Store which features matte brass upper cabinets and an un-lacquered brass faucet. The great thing about all three trends are that they can be used alone or together to complement each other. 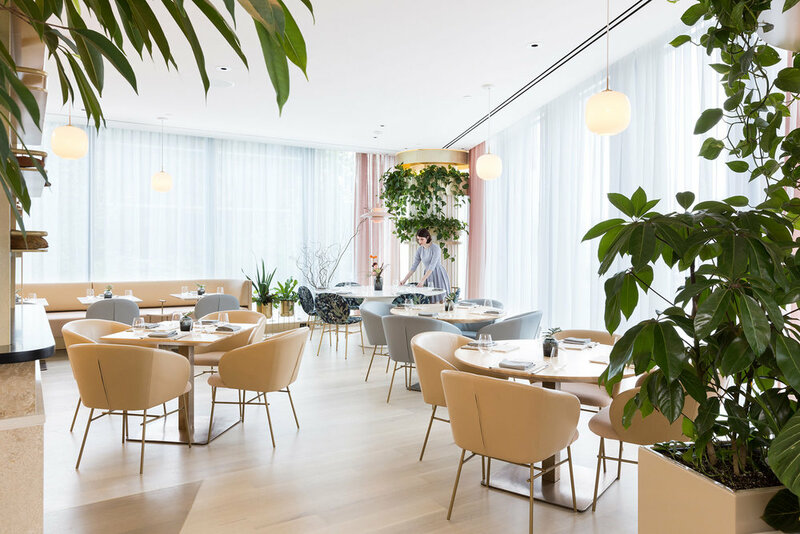 One examples of all three trends being used together here in Vancouver is the Botanist Restaurant designed by Ste. Marie Art + Design. What do you think of this trend? Leave us a comment below or stop by Botanist – you may see one of us sipping on a cocktail and enjoying the beautiful space!